Joe and Margaret Posey live just a few miles from Frisco in a homey cabin nestled among the pines and willows. Bright red flowers hang from pots on the deck, red chairs sit outside the door and red trim siding adorns the wood cabin. It has as much sentimental value as property value, the Posey’s said, and the couple would love for it to stay in their family for many generations to come. The Posey’s live in a pictureseque setting. But, like many Summit County homeowners, they also live in an area where a wildfire could threaten their home. They decided to call the Lake Dillon Fire Department after a meeting with the fire chief at a meeting of the Bill’s Ranch Neighborhood Association to schedule a ‘defensible space’ site visit. “Because I love this area so much, I want to protect it as much as I can,” Margaret Posey said. “When I learned they would come and walk the property with you, I jumped on it,” she said. 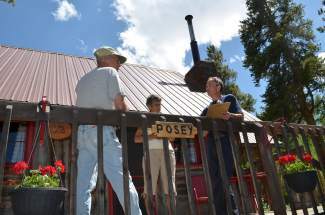 Steve Lipsher, the Lake Dillon Fire Rescue public affairs coordinator, arrived to the Posey’s property on Friday’s sunny afternoon. For about an hour, he walked around the property, inspecting the trees, the deck, the house siding and woodpiles near their home. Lipsher said the fire department has had a boon in the amount of calls since the outbreak of the Black Forest Fire. “When we have destructive wildfires in Colorado people become more receptive to our message,” Lipsher said. “You see those homes smoldering in news coverage and you hear the accounts of residents who have lost everything, and it brings it close to home,” he said. Firefighters will do whatever they can with the resources they have to protect lives. But they will not put themselves in a situation that endangers their own lives to protect a property, Lipsher said. Homeowners who are proactive have a better chance of saving their homes if a wildfire does occur, he said. The best way Summit County residents can protect their property is by creating a ‘defensible space’ around their home. Defensible space is the area around a building that’s been cleared of flammable vegetation and objects that burn. It allows firefighters to make a stand between an encroaching wildfire and the building. “It’s basically a cleared out area where our firefighters can try to intervene and prevent a fire from hitting a home,” Lipsher said. As Lipsher investigated the property, he found the Posey’s had done many things right. They had trimmed their trees up high, and there was adequate space between the trees and the house. They had a metal roof, and cleaned their gutters regularly. They had also ‘chinked’ areas in between wood siding – an area where embers can smolder and hide. And for the most part, they had at least 10 feet between vegetation and structures. But Lipsher found some aspects of the property that put the Poseys at risk. They had flammable items set against the house. Their wood pile was a little too close to the home, and a few willow trees could be trimmed back from the property. Also, pine needles had gathered between the deck and the home that would provide a perfect fuel for a wildfire. At the end of the site visit, Lipsher went over a residential defensible space inspection form. He discussed the items with the homeowners – and urged them to use the checklist to make some changes to the home. “It really gave us a lot to think about,” Margaret Posey said after the property inspection. “It’s great to have a checklist and we will certainly work on it,” she said.